Adventure Tots opened on 16 October 2000. It was the result of several years planning and, in the run-up to opening, months of intense activity. 1 - Who Are We? 2 - What Do We Do? 3 - Where Are We? 4 - How Can You Contact Us? If you do nothing else, do try to make sure that people can find you when they look for you. 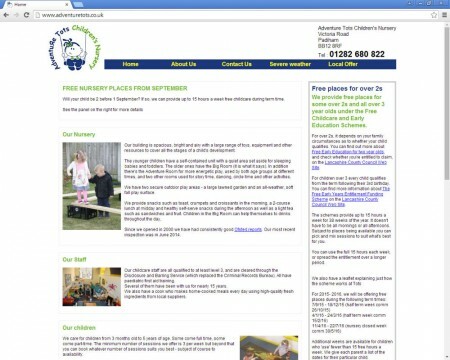 This is exactly what we suggested to Adventure Tots and we think the site looks and works well. Over and above the 4 golden elements listed above, Adventure Tots also use the site as a Notice Board that helps their Parents to keep in touch and up to date with important events and dates.